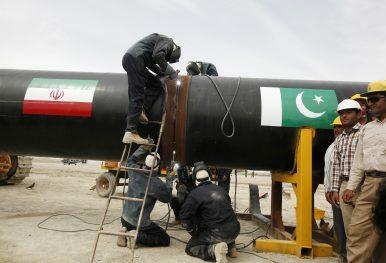 Irani workers weld the pipeline during a groundbreaking ceremony to mark the inauguration of the Iran-Pakistan gas pipeline, in the city of Chabahar in southeastern Iran (March 11, 2013). Given continued American global naval supremacy, which is unlikely to be challenged successfully in the foreseeable future, Beijing’s highest strategic priority is to ensure energy security by connecting friendly major oil and gas producers to China via pipelines transiting through land routes beyond the effective military reach of the United States. If successful, within a generation China’s new “Silk Roads” – land pipelines, together with roads and railways – will transport enough oil and gas to meet the country’s import requirements. While the Pentagon’s assessment is certainly true for the short term, it would not be prudent to shape long term American grand strategy with respect to China on the premise of Beijing’s continued dependence on sea-borne energy imports. The Energy Information Administration (EIA), the statistical arm of the U.S. Department of Energy, in its International Energy Outlook 2016 estimates China’s oil imports in 2015 amounted to about 6.6 million barrels per day (b/d), representing 59 percent of the country’s total oil consumption. By 2035, the EIA projects China’s oil imports will rise to about 9.7 million b/d, accounting for about 62 percent of total oil consumption. While not as stark as its dependency on imported oil, China’s reliance on imported natural gas is also significant. According to the EIA, China’s natural gas imports, which amounted to 1.4 trillion cubic feet (Tcf) in 2015 (about 24 percent of consumption), are expected to rise to 6 Tcf (about 26 percent of consumption) in 2035. The EIA forecast on China’s energy imports implies a rather modest annual growth rate of about 2 percent for oil imports and a more robust 7.5 percent annual growth rate for gas imports. By 2035, China’s GDP (in terms of purchasing power parity) will grow to $43.7 trillion, about 1.6 times larger than the $26.7 trillion projected for the United States or $27.8 trillion estimated for the European Union (EU). China certainly has the economic and financial capacity to underwrite the costs of its ambitious effort to develop alternate land routes to bypass current maritime routes. Russia and Iran are the only two major energy exporters outside the camp of the United States who have significant enough oil and gas reserves to potentially satisfy all of China’s oil and gas import requirements on a sustainable basis. Beijing’s energy security strategy is designed around a simple and straightforward bargain: economic security for Russia and Iran (based on assured Chinese demand) in return for energy security for China (based on reliable and secure supply via land-based pipelines from Russia and Iran). In this case, interdependence is perceived to be mutually beneficial. The EIA estimates that as of 2015 Russia has proved reserves of 80 billion barrels of oil and 1,688 Tcf of natural gas (the world’s largest reserves of gas). In 2015, it produced 11 million b/d of oil and 22.4 Tcf of gas, of which 7.5 million b/d of oil and 7.3 Tcf of gas were exported. By 2035, the EIA forecasts that Russian energy production will rise to 11.8 million b/d of oil and 29.3 Tcf of gas, of which 8.1 million b/d of oil and 12.3 Tcf of gas will be exported. Per EIA’s base case projection, in 2035 Russia could satisfy about 85 percent of China’s oil import requirements (8.1 of 9.7 million b/d) and all of China’s needs for natural gas imports (6 Tcf). It is reasonable to assume that Russia could increase oil production above the base case projection by about 1 percent per annum over the next two decades to completely satisfy all of China’s oil import requirements in 2035. China shares a 4,179 kilometers (km) land border with Russia, so pipelines connecting Russian oil and gas fields to northeastern China would be secure and energy flows could not be effectively shut down by the United States. Of course, transforming potential into reality will be both time-consuming and expensive, reflecting the need to develop oil and gas fields, increase production, and build and expand pipeline networks. From an energy security perspective, Russia would have to pivot from Europe to China. Currently, Russia is highly dependent upon energy exports to the European Union for its economic security. According to the EIA country analysis brief on Russia, energy exports accounted for about 43 percent of Russian government revenues in 2015. In that year, Russia sent about 60 percent of its oil exports (4.5 million b/d) and 75 percent of its gas exports (5.5 Tcf) to the EU (supplying about 30 percent of European requirements for imported oil and gas). In 2015, Russian oil exports to China amounted to a mere 852,000 b/d, accounting for about 13 percent of China’s imported oil requirements, while Russian gas exports to China were negligible. However, the imposition of U.S. and EU sanctions on Russia in the wake of its annexation of Crimea in 2014 has pushed Moscow to reorient its energy export strategy and shift its focus from Europe to China. Russia’s need for economic security in the form of reliable demand for its energy exports is perfectly aligned with China’s need for energy security in the form of reliable supply to meet its energy imports requirements. The nascent East Siberia-Pacific Ocean (ESPO) pipeline connecting Russian oil fields in eastern Siberia to northeastern China (current planned capacity of 2.6 million b/d by 2020), and the Power of Siberia (POS) gas pipeline to northeastern China (current planned capacity of 3.3 Tcf by 2020) symbolize the beginning of the Sino-Russian energy partnership. In order to satisfy all of China’s energy import requirements by 2035, the capacity of the ESPO oil pipeline network would have to be quadrupled to 10.4 million b/d while the capacity of the Power of Siberia gas pipeline network would have to be doubled to 6.6 Tcf. Complementing the ESPO expansion project, there will have to be an expansion (additional capacity of about 5 million b/d) of the existing pipeline network connecting western and eastern Siberian oil fields to accelerate Moscow’s energy pivot, and a huge expansion of the spur line connecting ESPO to China (current planned capacity of 0.6 million b/d by 2018) to 10.4 million b/d. These oil and gas pipeline expansion projects will have to be completed over the next 20 years – a very aggressive but not insurmountable undertaking. Strategic prudence (and history of tension between China and Tsarist as well as Soviet Russia) suggests that both Moscow and Beijing would seek to hedge their mutual interdependence. Accordingly, Russia will strive to maintain its energy ties to Europe while increasing its energy partnership with China. Likewise, China will seek to diversify its energy supply sources. From China’s energy security perspective, Iran represents an ideal hedge, as it is outside the control of both the United States and Russia. And Iran, which has endured the crippling effects of U.S.-led energy sanctions (targeted primarily against Tehran’s nuclear power program), clearly needs an alternative to energy exports to Europe. According to the International Monetary Fund (IMF), oil revenues accounted for about 46 percent of Iranian government revenues in 2014. Assured Chinese demand for its oil and gas exports would guarantee Iranian economic security. The EIA estimates that as of 2015 Iran has proven reserves of 158 billion barrels of oil (the fourth largest after Venezuela, Saudi Arabia, and Canada) and 1,201 Tcf of natural gas (the second largest after Russia). Iran shares a common border with southwestern Pakistan while China shares a common border with northwestern Pakistan, so land-based oil and gas pipelines connecting Iran to China via Pakistan would make sense. China and Iran have no history of conflict, and China and Pakistan have been allies for over half a century. Reflecting the impact of U.S.-led energy sanctions, EIA’s most recent figures indicate that Iran produced 3.4 million b/d of oil (2014) and 5.7 Tcf of gas (2013), of which 1.6 million b/d of oil and a negligible amount of gas (0.1 Tcf) were exported. In 2014, Iranian oil exports to China amounted to about 558,000 b/d (representing 9 percent of China’s oil imports). If, over the next two decades, Tehran can boost oil production at an annual growth rate of 6.75 percent while at the same time restraining annual domestic oil consumption growth to 2.5 percent, then by 2035 Iran’s oil exports would amount to 9.6 million b/d, reflecting oil production of 12.6 million b/d and oil consumption of 3 million b/d. Similarly, if Iranian natural gas production increases at an annual growth rate of 6.75 percent while domestic gas consumption growth is limited to 5 percent per annum, then by 2035 Iran’s gas exports would amount to 6.1 Tcf based on gas production of 21 Tcf and gas consumption of 14.9 Tcf. The United States should not underestimate China’s ability to achieve energy security within the next two decades. China’s Silk Road strategy, which completely bypasses the global maritime commons, is Beijing’s non-military solution to U.S. global naval dominance. Once the new overland pipelines for black gold are fully operational, the United States no longer will have the ability to sever Beijing’s energy lifeline. And China may no longer be deterred from resorting to military action in support of its proclaimed core interests to force Taiwan reunification, seize the Diaoyu/Senkaku islands from Japan, and enforce its nine-dash maritime boundary in the South China Sea. However, Beijing’s gain is not necessarily Washington’s loss. A realistic assessment of U.S. vital national interests in an increasingly multi-polar world would suggest that China’s limited aspirations do not adversely impact America’s global sphere of influence and its status as the sole global power. A modus vivendi is in the mutual interests of both countries. Samir Tata is the founder of International Political Risk Analytics, based in Reston, VA. He has previously served as an intelligence analyst with the National Geospatial-Intelligence Agency, a staff assistant to Senator Dianne Feinstein, and a research associate with Middle East Institute, Atlantic Council, and National Defense University.